The INdian rupee (sign: ₹ ; code: INR) is the official currency of India. The rupee is subdivided into 100 paise (singular paisa), though as of 2018, coins of denomination of 50 paise or half rupee is the lowest value in use. The issuance of the currency is controlled by the Reserve Bank of India. The Reserve Bank manages currency in India and derives its role in currency management on the basis of the Reserve Bank of India Act, 1934. In 2012, a new rupee symbol '₹', was officially adopted. It was designed by D. Udaya Kumar. It was derived from the combination of the Devanagari consonant "र" (ra) and the Latin capital letter "R" without its vertical bar (similar to the R rotunda). The parallel lines at the top (with white space between them) are said to make an allusion to the tricolour Indian flag,  and also depict an equality sign that symbolises the nation's desire to reduce economic disparity. The first series of coins with the new rupee symbol started in circulation on 8 July 2011. Before this India used to use Rs for plural and Re to depict one rupee. The Mahatma Gandhi New Series of banknotes are issued by the Reserve Bank of India (RBI) as the legal tender of the Indian rupee, intended to replace the Mahatma Gandhi Series of banknotes. Announced on November 8, 2016, it followed the demonetisation of ₹500 and ₹1000 banknotes of the original Mahatma Gandhi Series. Similar to the preceding series of banknotes, the obverse of the Mahatma Gandhi New Series banknotes also prominently displays the portrait of Mahatma Gandhi. The logo of Swachh Bharat Abhiyan is also printed on the back of the banknotes of this series. The word "rupee" was derived from the Sanskrit word rūpya and Hindustani rupaya (meaning "wrought silver, a coin of silver"). Panini characterised rūpya as a stamped rūpa (which means a form in general, but probably a silver form in this case). Arthashastra , written by Chanakya, prime minister to the first Maurya emperor Chandragupta Maurya (c 340–290 BCE), mentions silver coins as rūpyarūpa. Other types of coins including gold coins (suvarṇarūpa), copper coins (tāmrarūpa) and lead coins (sīsarūpa) are also mentioned. The Arthashastra is an ancient Indian treatise on statecraft, economic policy and military strategy, written in Sanskrit. Likely to be the work of several authors over centuries, Kautilya, also identified as Vishnugupta and Chanakya, is traditionally credited as the author of the text. The latter was a scholar at Takshashila, the teacher and guardian of Emperor Chandragupta Maurya. However, scholars have questioned this identification. Composed, expanded and redacted between the 2nd century BCE and 3rd century CE, the Arthashastra was influential until the 12th century, when it disappeared. It was rediscovered in 1905 by R. Shamasastry, who published it in 1909. The first English translation was published in 1915. 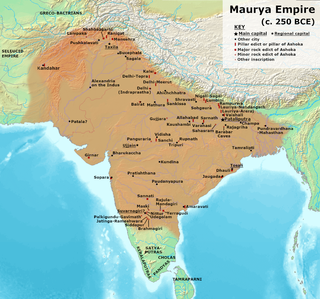 The Maurya Empire was a geographically-extensive Iron Age historical power based in Magadha and founded by Chandragupta Maurya which dominated the Indian subcontinent between 322 and 187 BCE. 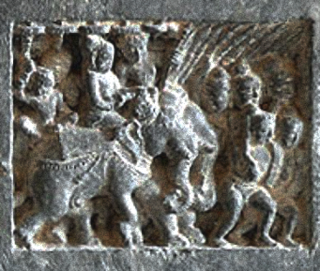 Comprising the majority of South Asia, the Maurya Empire was centralized by the conquest of the Indo-Gangetic Plain, and its capital city was located at Pataliputra. The empire was the largest political entity to have existed in the Indian subcontinent, spanning over 5 million square kilometres at its zenith under Ashoka. Chandragupta Maurya was the founder of the Maurya Empire in ancient India. He built one of the largest-ever empires on the Indian subcontinent and then, according to Jain sources, he renounced it all and became a monk. During his five-year rule from 1540 to 1545, Sultan Sher Shah Suri issued a coin of silver, weighing 178 grains (or 11.53 grams), which was termed the Rupiya. During Babar's time, the brass to silver exchange ratio was roughly 50:2. The silver coin remained in use during the Mughal period, Maratha era as well as in British India. Among the earliest issues of paper rupees include; the Bank of Hindustan (1770–1832), the General Bank of Bengal and Bihar (1773–75, established by Warren Hastings), and the Bengal Bank (1784–91). These recommendations were acceptable to both governments, and were shortly afterwards translated into laws. 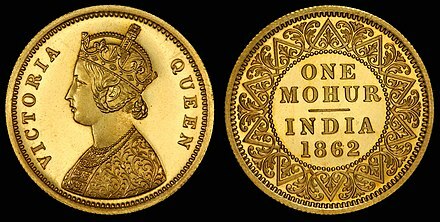 The act making gold a legal tender was promulgated on September 15, 1899 ; and preparations were soon thereafter undertaken for the coinage of gold sovereigns in the mint at Bombay. This law was just to defraud Indian people, as gold sovereign coins were never minted in India. The Indian rupee replaced the Danish Indian rupee in 1845, the French Indian rupee in 1954 and the Portuguese Indian escudo in 1961. Following the independence of British India in 1947 and the accession of the princely states to the new Union, the Indian rupee replaced all the currencies of the previously autonomous states (although the Hyderabadi rupee was not demonetised until 1959). Some of the states had issued rupees equal to those issued by the British (such as the Travancore rupee). Other currencies (including the Hyderabadi rupee and the Kutch kori) had different values. The design of banknotes is approved by the central government, on the recommendation of the central board of the Reserve Bank of India. Currency notes are printed at the Currency Note Press in Nashik, the Bank Note Press in Dewas, the Bharatiya Reserve Bank Note Mudran (P) Ltd at Salboni and Mysore and at the Watermark Paper Manufacturing Mill in Hoshangabad. The Mahatma Gandhi Series of banknotes are issued by the Reserve Bank of India as legal tender. The series is so named because the obverse of each note features a portrait of Mahatma Gandhi. Since its introduction in 1996, this series has replaced all issued banknotes of the Lion capital series. The RBI introduced the series in 1996 with Rs10 and Rs 500 banknotes. At present, the RBI issues banknotes in denominations from ₹5 to ₹2,000. The printing of Rs 5 notes (which had stopped earlier) resumed in 2009. On 8 November 2016, the Reserve Bank of India (RBI) announced the issuance of new ₹500 and ₹2,000 banknotes in new series. The new ₹2,000 banknote has a magenta base colour, with a portrait of Mahatma Gandhi as well as the Ashoka Pillar Emblem on the front. The denomination also has a motif of the Mars Orbiter Mission (MOM) on the back, depicting the country's first venture into interplanetary space. The new ₹500 banknote has a stone grey base colour with an image of the Red Fort along with the Indian flag printed on the back. Both the banknotes also have the Swachh Bharat Abhiyan logo printed on the back. The banknote denominations of ₹200, ₹100 and ₹50 have also been introduced in the new Mahatma Gandhi New Series intended to replace all banknotes of the previous Mahatma Gandhi Series. On 13 June 2017, RBI introduced new ₹50 notes, but the old ones continue being legal tender. The design is similar to the current notes in the Mahatma Gandhi (New) Series, except they will come with an inset 'A'. As of 24 August 2017, current circulating banknotes are in denominations of ₹5, ₹10, ₹20, ₹50 and ₹100 from the Mahatma Gandhi Series, in denominations of ₹10, ₹50, ₹100,  ₹200, ₹500 and ₹2,000 from the Mahatma Gandhi New Series, and the denomination of ₹1 of the Lion Capital Series. Also affecting convertibility is a series of customs regulations restricting the import and export of rupees. Legally, only up to ₹25000 can be imported or exported in cash at a time, and the possession of ₹200 and higher notes in Nepal is prohibited. The conversion of currencies for and from rupees is also regulated. There is some confusion regarding the interchange of the currency with gold, but the system that India follows is that money cannot be exchanged for gold under any circumstances due to gold's lack of liquidity;[ citation needed ] therefore, money cannot be changed into gold by the RBI. India follows the same principle as Great Britain and the US. The history of the Rupee traces back to the Ancient India in circa 6th century BC. Ancient India was the earliest issuers of coins in the world, along with the Chinese wen and Lydian staters. The rupee was the currency of Burma between 1852 and 1952, except for the years 1943–1945. The Indian 1000-rupee banknote was a denomination of the Indian rupee. It was first introduced by the Reserve Bank of India in 1938 under British rule and subsequently demonetized in 1946. Post-independence, the denomination was re-introduced in 1954. In January 1978, all high-denomination banknotes of ₹1000, ₹5,000, and ₹10,000 were not demonetized in order to curb unaccounted cash money. The Indian Two paise, is a unit of currency equaling ​2⁄100 of the Indian rupee. The symbol for paisa is p.
The Indian Two naye paise, is a unit of currency equaling ​2⁄100 of the Indian rupee. The symbol for paisa is p.
The Indian Three paise, is a unit of currency equaling ​3⁄100 of the Indian rupee. The symbol for paisa is p.
The Indian five naye paise, was a unit of currency equaling ​1⁄20 of the Indian rupee. The symbol for paisa is p.
The Indian five paise, was a unit of currency equaling ​1⁄20 of the Indian rupee. The symbol for paisa is p.
↑ "APPENDIX TABLE 4: INFLATION, MONEY AND CREDIT" (PDF). Reserve Bank of India. 29 August 2016. 1 2 "Reserve Bank of India FAQ — Your Guide to Money Matters". Rbi.org.in. Archived from the original on 12 January 2012. Retrieved 5 November 2014. ↑ Mukherjee, Amrita (14 November 2016). "How I feel super rich with Rs 100 and Rs 10 in my purse". www.atimes.com. Retrieved 16 November 2016. ↑ Asia Times, Staff (15 November 2016). "India's demonetization takes its toll on major sectors". www.atimes.com. Retrieved 16 November 2016. ↑ Alpana Killawala (8 November 2016). "Withdrawal of Legal Tender Status for ₹ 500 and ₹ 1000 Notes: RBI Notice" (Press release). Reserve Bank of India. Retrieved 13 November 2016. ↑ Alpana Killawala (8 November 2016). "Issue of ₹500 Banknotes (Press Release)" (PDF) (Press release). Reserve Bank of India . Retrieved 8 November 2016. ↑ Alpana Killawala (8 November 2016). "Issue of ₹2000 Banknotes (Press Release)" (PDF) (Press release). Reserve Bank of India . Retrieved 8 November 2016. ↑ "RBI to issue ₹1,000, ₹100, ₹50 with new features, design in coming months". 10 November 2016. ↑ "RBI Introduces ₹ 200 denomination banknote". 24 August 2017. ↑ "RBI to Issue New Design ₹ 100 Denomination Banknote". 19 July 2018. ↑ "roopyakam – meaning in English". ↑ Redy. "AIndia.htm". Worldcoincatalog.com. Retrieved 20 June 2013. ↑ etymonline.com (20 September 2008). "Etymology of rupee" . Retrieved 20 September 2008. ↑ Mughal Coinage Archived 16 May 2008 at the Wayback Machine at RBI Monetary Museum. Retrieved on 4 May 2008. ↑ "Coinage — Pre-Colonial India Coinage". Rbi.org.in. Retrieved 20 June 2013. 1 2 3 4 "Indian Currency Problems of the Last Decade. the Quarterly Journal of Economics, August, 1901". Archive.org. Retrieved 2018-04-18. 1 2 3 "The Silver Question". Archive.org. 2016-10-23. Retrieved 2018-04-18. ↑ "The Theory and Practice of Banking, By Henry Dunning Macleod, 1883". Books.google.com.pk. Retrieved 2018-04-18. 1 2 "Indian Currency and Finance by John Maynard Keynes/Chapter I". 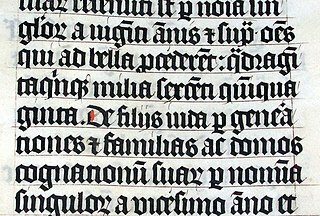 en.wikisource.org. 1913. Retrieved 2019-03-25. 1 2 Dickson H Leavens (1939). "Silver Money" (PDF). cowles.yale.edu. ↑ Rezwan Razack; Kishore Jhunjhunwalla (2012). The Revised Standard Reference Guide to Indian Paper Money . Coins & Currencies. ISBN 978-81-89752-15-6. ↑ "Straits Settlements (1867–1946)". Dcstamps.com. 2014-05-13. Retrieved 2018-04-18. ↑ "Internationalisation of currency: the case of the Indian rupee and Chinese renminbi" (PDF). Rib staff studies. Retrieved 1 March 2010. ↑ "Don't take 1,000 and 500 Indian rupee notes to Nepal". Rib staff studies. Retrieved 27 October 2014. ↑ "Zimbabwe's multi-currency confusion". BBC News. 1 2 "Issue of new series of Coins". RBI. Retrieved 4 November 2011. ↑ "Coins of 25 paise and below will not be Legal Tender from June 30, 2011 : RBI appeals to Public to Exchange them upto June 29, 2011". RBI. 18 May 2011. Retrieved 23 January 2012. ↑ "Reserve Bank of India — Coins". Rbi.org.in. Archived from the original on 19 November 2011. Retrieved 5 November 2011. ↑ Reserve Bank of India – Coins. Rbi.org.in. Retrieved on 28 July 2013. ↑ Gaikwad, Rahi (9 January 2015). "India, South Africa discuss UNSC reforms". The Hindu. Chennai, India. Retrieved 9 January 2015. ↑ "Teachers' day: PM Narendra Modi releases Rs 125 coin in honour of Dr S Radhakrishnan". Financial Express. 4 September 2016. Archived from the original on 23 April 2016. Retrieved 10 November 2016. ↑ "PM Narendra Modi releases Rs 10, Rs 125 commemorative coins honouring Dr Babasaheb Ambedkar". Financial Express. 6 December 2016. Archived from the original on 23 April 2016. Retrieved 10 November 2016. ↑ "Currency Notes without Asoka Pillar Emblem to Cease to be Legal Tender" (PDF). Press Information Bureau of India – Archive. ↑ "Legal Tender of Currency and Bank Notes" (PDF). Press Information Bureau of India – Archive. ↑ "Issue of ` 10/- Banknotes with incorporation of Rupee symbol (`)". RBI. Retrieved 23 January 2012. ↑ "Issue of ` 500 Banknotes with incorporation of Rupee symbol". RBI. Retrieved 23 January 2012. ↑ "Issue of ` 1000 Banknotes with incorporation of Rupee symbol". RBI. Retrieved 23 January 2012. ↑ "Issue of `100 Banknotes with incorporation of Rupee symbol". RBI. Retrieved 23 January 2012. ↑ "Withdrawal of Currencies Issued Prior to 2005". Press Information Bureau. 25 July 2014. Retrieved 25 July 2014. ↑ "RBI to issue ₹1,000, ₹100, ₹50 with new features, design in coming months". Thehindubusinessline.com. Retrieved 2018-04-18. ↑ "Reserve Bank of India - Press Releases". rbi.org.in. Retrieved 2018-07-20. ↑ India Re-introduces the One Rupee (Rs 1) Banknote in 2015 navonanumis.blogspot.com. 25 May 2015. Retrieved on 2nd July 2018. ↑ "Triennial Central Bank Survey Foreign exchange turnover in April 2016" (PDF). Triennial Central Bank Survey. Basel, Switzerland: Bank for International Settlements. 11 December 2016. p. 7. Retrieved 22 March 2017. ↑ The total sum is 200% because each currency trade always involves a currency pair; one currency is sold (e.g. US$) and another bought (€). Therefore each trade is counted twice, once under the sold currency ($) and once under the bought currency (€). The percentages above are the percent of trades involving that currency regardless of whether it is bought or sold, e.g. the U.S. Dollar is bought or sold in 87% of all trades, whereas the Euro is bought or sold 31% of the time. ↑ Chandra, Shobhana (26 September 2007). "'Neither the government nor the central bank takes a view on the rupee (exchange rate movements), as long as the movement is orderly', says Indian Minister of Finance". Bloomberg.com. Retrieved 5 November 2011. ↑ "RBI Master Circular on Import of Goods and Services". Rbi.org.in. Retrieved 25 August 2013. ↑ "RBI Master Circular on Export of Goods and Services". Rbi.org.in. Archived from the original on 17 August 2013. Retrieved 25 August 2013. ↑ Rituparna Kar and Nityananda Sarkar: Mean and volatility dynamics of Indian rupee/US dollar exchange rate series: an empirical investigation in Asia-Pacific Finan Markets (2006) 13:41–69, p. 48. doi : 10.1007/s10690-007-9034-0 . ↑ "The "Fuller Capital Account Convertibility Report"" (PDF). 31 July 2006. Archived from the original (PDF) on 5 February 2009. Retrieved 23 January 2009. ↑ "Withdrawal of Legal Tender Status for ₹ 500 and ₹ 1000 Notes: RBI Notice (Revised)". Reserve Bank of India. 8 November 2016. Retrieved 8 November 2016. ↑ "Here is what PM Modi said about the new Rs 500, Rs 2000 notes and black money". India Today. 8 November 2016. Retrieved 9 November 2016. ↑ [http:/ /timesofindia.indiatimes.com/india/Rs-500-and-Rs-1000-notes-pulled-out-of-circulation-immediately-PM-Narendra-Modi/articleshow/55315473.cms "Notes out of circulation"] Check |url= value (help). The Times of India. 8 November 2016. ↑ Saurabh Chandra (21 August 2013). "The fallacy of 'dollar = rupee' in 1947" . Retrieved 22 August 2013. ↑ "Historical exchange rates from 1953 with graph and charts". Fxtop.com. Retrieved 2018-04-18. ↑ "historical exchange rates". fxtop.com. Retrieved 2018-04-18. ↑ "FXHistory: historical currency exchange rates" (database). OANDA Corporation. Archived from the original on 4 April 2006. Retrieved 1 September 2009. ↑ "The fallacy of 'dollar = rupee' in 1947". DNA. Retrieved 19 August 2013. Wikimedia Commons has media related to Rupee (India) .